I doubt I’ll make it to the gym this afternoon. I also doubt the Gaza treaty will work. That’s the funny thing about doubt – it is constantly there; from the most insignificant suspicion to the most important allegation. Doubt is set in the cold, wet and windy grounds of St Nicholas school in The Bronx, NY, which Sister Aloysius Beauvier (Meryl Streep) rules with an iron fist. When she begins to suspect Father Brendan Flynn (Phillip Seymour Hoffman) of abusing of a black student, she makes it her mission to bring him down. What follows is a power play between a woman who is too certain – or too proud – to go back on her word, and a man who is either too powerless – or too guilty – to fight it. 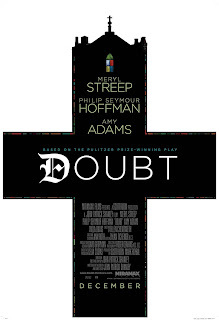 Doubt is based on a play of the same name, and it shows, with only three scenes in the entire 103-minute film. But it never feels boring. The wind howls and causes goosebumps to form on the back of your neck. Streep is both infuriating and enchanting, and Hoffman even more so.